All around hero of the local dance scene, Barney can be found every evening at a dance of one sort or another. He adores social dancing almost as much as his dance partners adore him. Ballroom, Blues, Lindy Hop, Charleston, Tango, you name it, he's done it, and odds are he's taught it, too. Currently he is the manager of the weekly Rhythm City Strut on Thursday nights, but more than that he is an ambassador of the dance: welcoming to beginners and inspiring to established dancers. "When in doubt, just swingout!" Dragged kicking and screaming to her first dance in high school, Becca started East Coast Swing at the tender age of 16, followed by a 7-year hiatus. 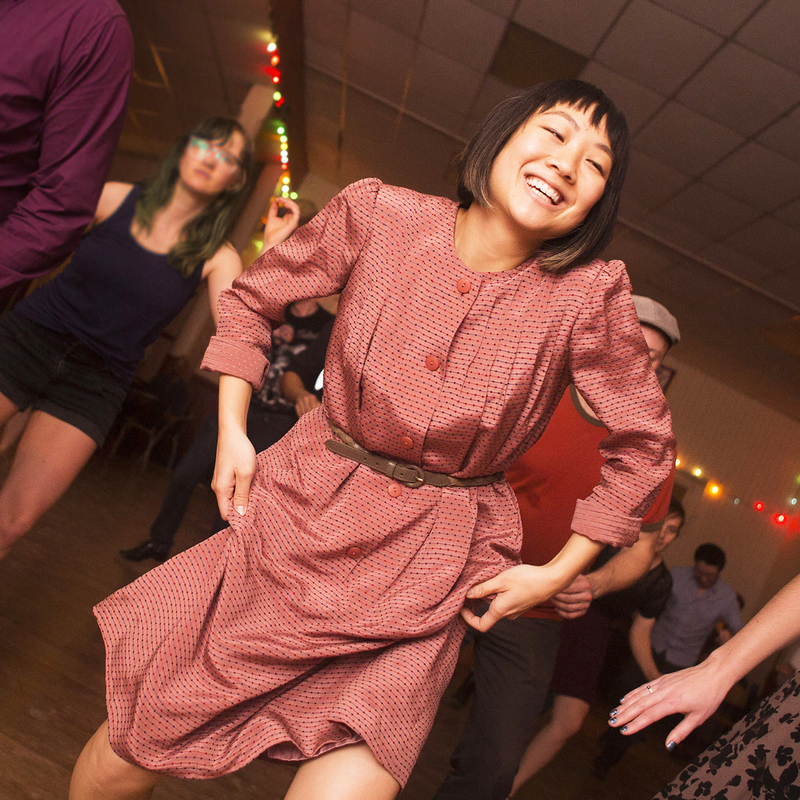 She discovered Lindy Hop in university and fell in love with the dance. 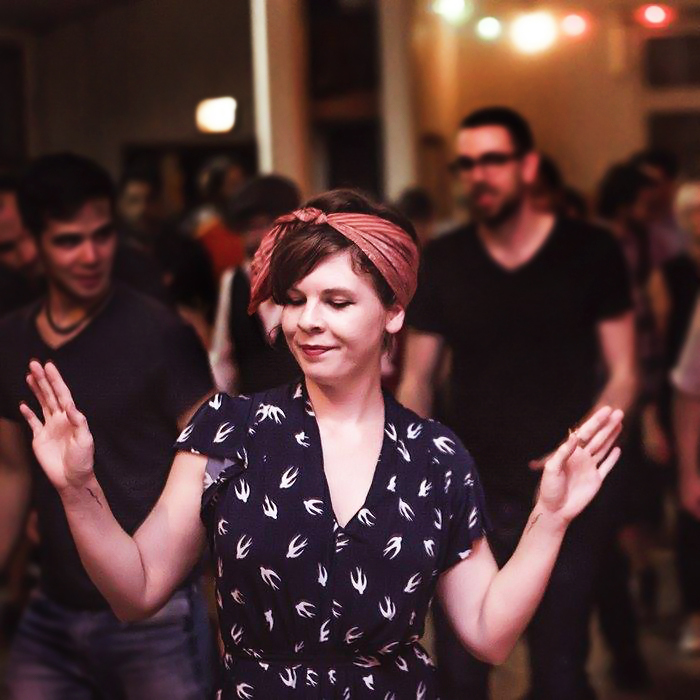 Becca is an avid Tap dancer and is constantly amazed by the many places aspects of Tap can fit into Lindy Hop. She also loves Balboa and feels the rotational energy of this dance helps her turns in other dances. Becca wants new dancers to keep these things in mind: never stop your basic and triple stepping, it's your engine that keeps you going and if it dies, you aren't dancing anymore. and remember -- that 'hot shot' you see ripping it up on the dance floor? he or she was a beginner at one point too! Doug grew up listening to his father play ragtime piano but only started dancing in his 40’s when he took his first Lindy hop class with Eric Shaw. Since then he’s become an avid social dancer who’s as interested in Solo Jazz improvising as he is in partner dancing. He also likes the heightened experience that competition brings and has made the finals in several local and regional events. One of his highlights was being a member of the winning performance team at Lindy Bout X — an event where he was also voted by his peers to win the spirit award. Doug continues to practice his basics while exploring more creative frontiers but still hasn’t learned not to watch inspiring dance videos right before bed. "Learn to dance with your own body and assets. Have fun." Edina has been teaching Lindy hop since 2005. She is champion, with Eric Shaw, of the Hellzapoppin competition in Utah, February 2008 and the Flyweight (Fast Lindy) competition at Lindy Bout II in April 2008, but her priorities as a dancer and teacher are in having fun with people, growing the scene and spreading the love of Lindy hop. 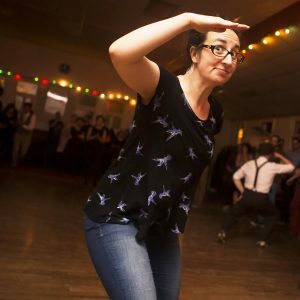 In addition to travelling to dance, compete, and attend workshops from the masters of Lindy hop, Edina keeps her inspiration up and swivels fabulous by dancing in her kitchen every chance she gets. 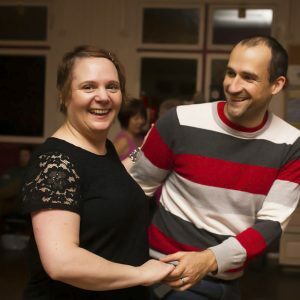 Following a childhood filled with modern dance, jazz, and ballet, Eileen discovered the joy of Lindy hop in September 2001, and hasn't stopped swivelling since. She is an avid instructor, event organizer, performer, competitor, judge, and, above all, social dancer. 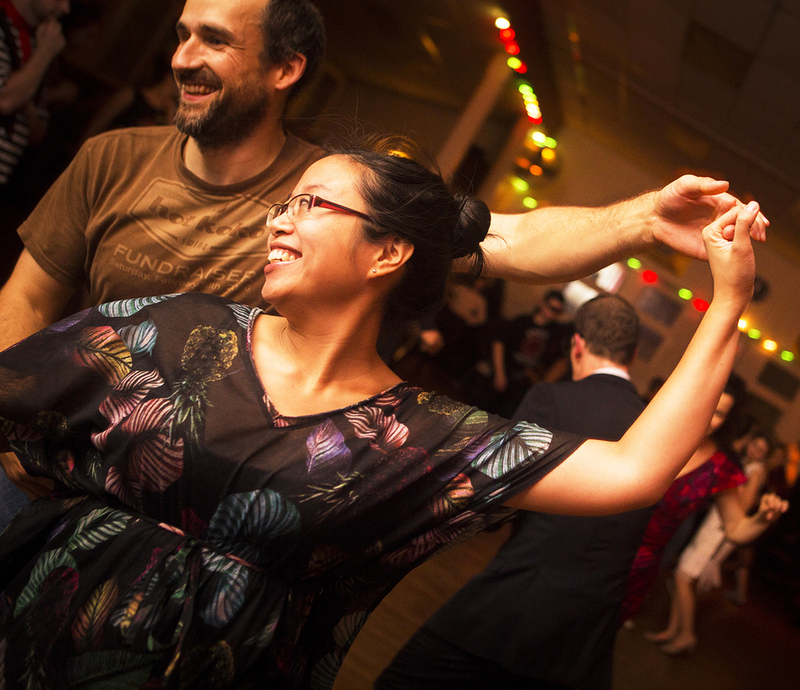 Eileen has a long and varied history of teaching, including gigs with the Vancouver Swing Society, UBC Swing Kids, SFU Swing Club, Jungle Swing, Red Hot Swing, and Swing Dynamite. As a competitor, Eileen has received top placements at Lindy Bout, Rhythm City Mess Around, and O-Town Showdown. She was a founding member of Hot Koko, and is proud to have been part of the first ever Canadian team to compete at the Ultimate Lindy Hop Showdown in 2006. One of Eileen's most inspirational experiences as a Lindy hopper was an intensive week of teacher training with Lennart Westerlund in Montreal in 2013. Eileen is happiest when dancing to live music, and aspires to speak jazz music with her body. When teaching, she works to help her students find their own rhythm and creative voice. 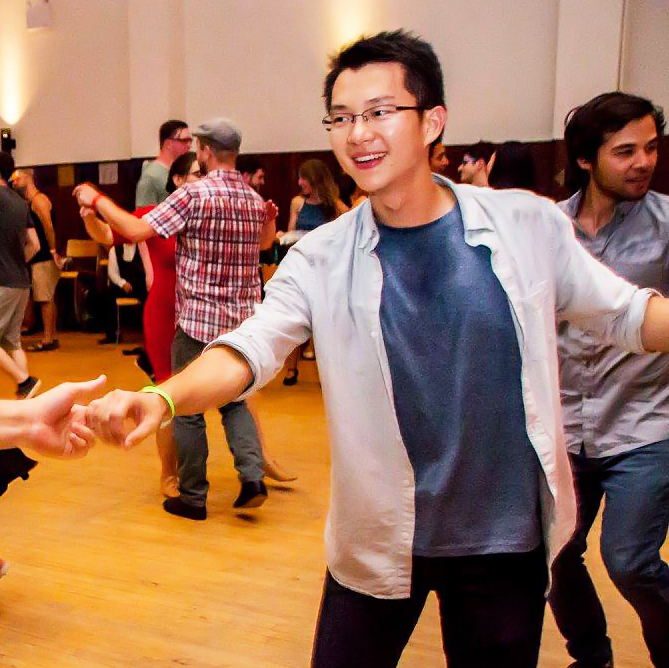 Enda discovered Lindy Hop in 2014 when he was visiting New York and saw people dancing in the street. He was immediately hooked on this joyful dance and started taking lessons with Zac and Christina at UBC after coming back to Vancouver. 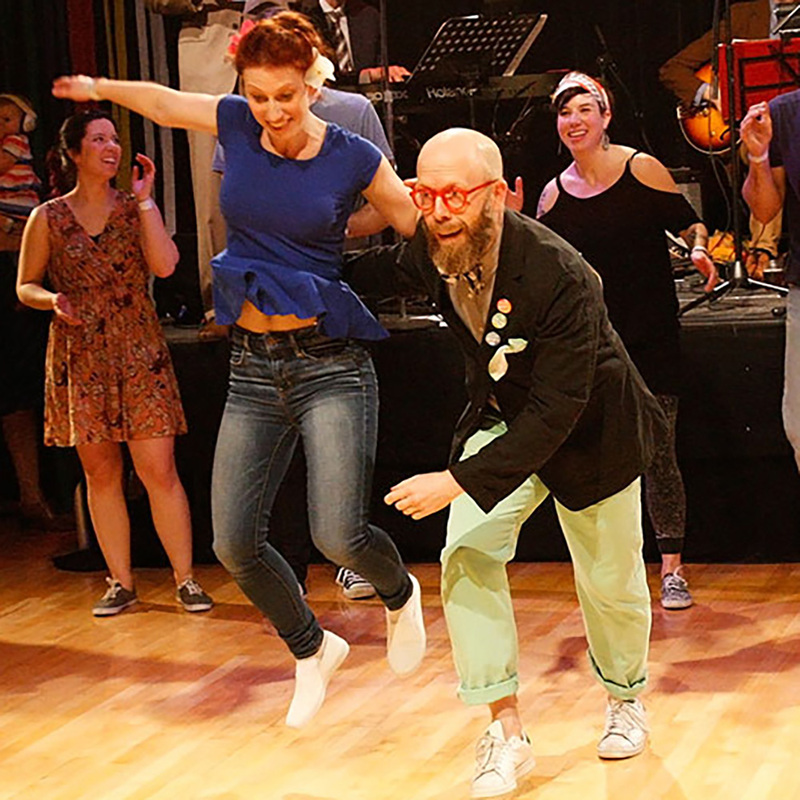 Lindy Hop combines two of his passions: jazz music and dance, and allows him to form deep connections with people from different backgrounds through nonverbal communication. 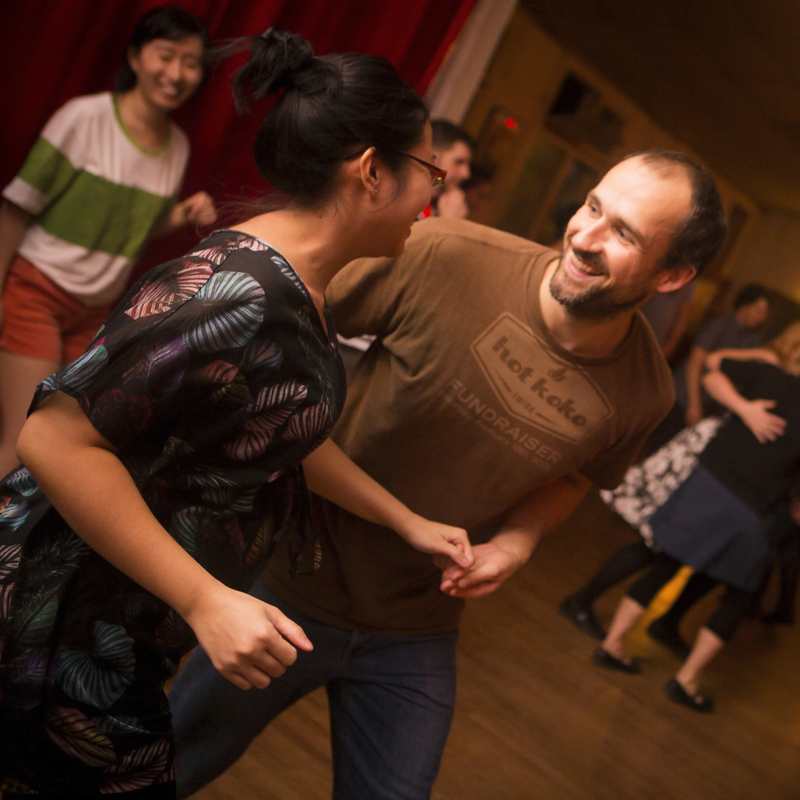 Enda began teaching with Rhythm City in the winter of 2018 and has brought Lindy Hop to his hometown – a lovely coastal city in southeast China. Referred to as "the Energizer Bunny" by his peers, Eric is as fearless and fierce on the social dance floor and in competition as he is mild-mannered in social settings. He travels to dance, train, and compete, but his greatest honour came in Vancouver, when he was chosen to train and perform with the South African performance group Umoja in January 2007. Although an avid performer and competitor, Eric's priorities remain in the realm of improvisation and the boundless potential in every partnered social dance, an approach that makes him one of the strongest, clearest, and most approachable teachers in the region. 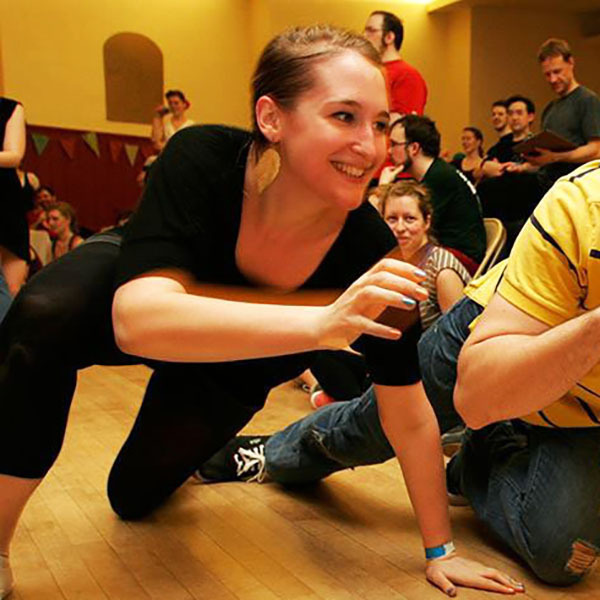 Kelsey discovered Lindy Hop in the Fall of 2009 when she found herself swooning over the instructor of the drop-in lesson. After summoning the courage to sign up for classes as an excuse to be around him, she ended up falling head over heels for the dance itself in a way that would eclipse any romance. Now a near-decade later, learning Lindy still stands out as one of the best decisions of her life. Known for the reverse-sonar of her laugh on the social floor, Kelsey delights in how no two social dances are alike. A writer and avid over thinker, she is grateful for how dancing takes her out of her head and puts her back into her body, forcing her to be present and trust that rhythm, connection, and creativity are things better felt into existence than analyzed. Kelsey is a Lindy Bout Knockdown and Intergenerational Mix & Match finalist, and has travelled as far as Sweden's Herräng Dance Camp and North Carolina's Balboa Experiment to further her skills. "Dancing transformed my life and I've watched it transform others. It's the best high in the world." Lisa teaches Balboa and Lindy hop and is celebrated for her ability to follow anything and remain cool in any storm. With a background in jazz and flamenco, Lisa started partner dancing via West Coast and East Coast Swing, but soon discovered Lindy hop and Balboa, and there her heart remains. She won the first Lindy hop contest she entered, in 2002, and was a founding member of Vancouver's award winning Hot Koko. Her ulterior motive as a dancer and teacher is to have more Lindy hoppers and Balboa enthusiasts to dance with. "You have to go too far to find out how far is far enough." 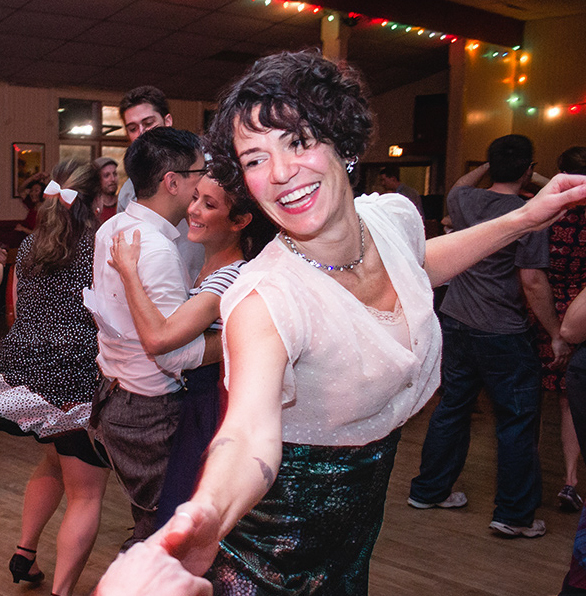 Lucy discovered Lindy hop in 1999, and has since travelled extensively to dance, train, and teach. She has taken up numerous other dances, all more or less in service to her first love: Lindy hop. The rhythmic and cultural roots of Vernacular Jazz dances of the Swing Era are a priority for Lucy in her teaching, dancing, and research. She aims to connect today's dancers with the histories and experiences of the Black American musicians and dancers who created and fostered the music and dances of this time. African dances, Tap, and related Jazz movement are great foundations to bring into Vintage Jazz dances (including Lindy hop, the original partnered Swing dance) of today. Lucy has taught Charleston, Vintage Jazz, Lindy Hop, and Blues across Canada and the Pacific Northwest, and at the world-famous Herräng Dance Camp, in Sweden. Her teaching approach is to encourage dancers to get a feel for the music, to move in a way that is comfortable and authentic to each person, and to keep it simple. Lindy hop is joyful! 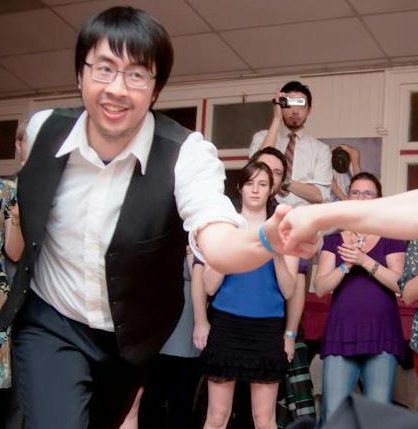 "Let's just try it, and see what happens..."
Matt started swing dancing in 2008, and has since traveled throughout North America to dance and compete in Lindy Hop and Balboa. Dance highlights include placements in the Lone Star Championships (Austin, TX) and the Eastern Balboa Championships (Raleigh, NC), as well as being a former member of Vancouver's award-winning Lindy Hop team, Granville Street Rhythm. Together with Angie Weddell, he is a founding member of the Vancouver Swing Society and currently serves as its Secretary-Treasurer. 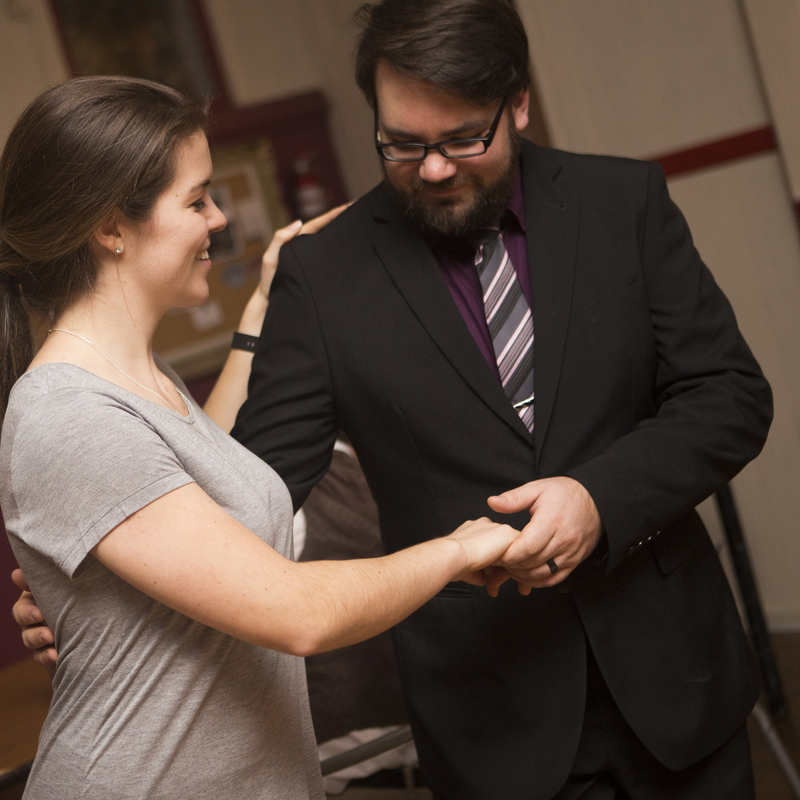 In class and on the dance floor, Matt emphasizes simple, natural motions and authentic swing dance patterns. However, he focuses above all on rhythm and musicality, and the space for improvisation that this allows. Front-line superstar and fixture of the Vancouver swing scene since 2012, Suzanna meets and greets all the students at the first class of every series, coordinates our hard-working volunteers, and hosts our weekly social dance, Rhythm City Strut. She loves seeing an event run smoothly from start to finish, and watching beginners and experienced dancers have a great time together on the dance floor. She appreciates being part of such a welcoming, fun-loving, and supportive community. Zac hails from the bustling metropolis of Chilliwack, BC, and first encountered Lindy Hop in 2007. He was a founding member of the 3-time Lindy Bout Champion Team, “Granville Street Rhythm,” and more recently a co-choreographer and co-founder of the “Barber Shaw’p Sextet”—which took home the Team award at Lindy Bout X! 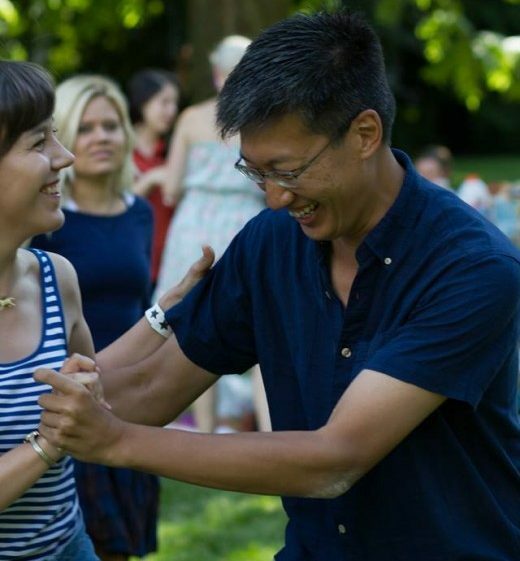 With his wife, Christina, Zac also taught beginner and intermediate lindy hop for the UBC Swing Kids (2010-2016), nurturing the next generation of swing dancers in his affable, approachable, and unflappable way. Constantly learning, Zac continues to challenge himself and work on his dancing through a variety of workshops, weekend solo jazz practice sessions, and while he’s teaching in the dance classroom. His classes emphasize listening to, feeling, and taking inspiration from the music above all. The translation of jazz music into movement, and movement back into music is where Zac thrives—and where he hopes his students will join him.